Troy Hovey of Castalia, Iowa, took charge on the first lap and never looked back in winning Friday’s Out-Pace USRA B-Mod main event during opening night of the 20th Annual Featherlite Fall Jamboree at the Deer Creek Speedway. 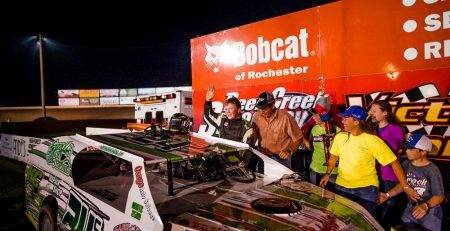 It was the 2013 Out-Pace USRA B-Mod national champion’s first win at ‘The Creek’ since winning the Friday night feature in 2014 at the Jamboree, and he took home $1,000 for his efforts in the Iron Man Challenge event. Allison, Iowa’s Trevor Fecht chased Hovey for the last half of the race but had to settle for the runner-up paycheck at the conclusion of the 20-lapper. Polesitter Dustin Steinbrink of Austin returned to the cockpit and garnered a third-place finish while second-generation racer Cory Jones of Zimmerman, Minn., was fourth. His father, Ron Jones, won the USMTS Modified feature at the first Fall Jamboree in 1999. Iron Man points leader Dan Hovden of Decorah, Iowa, finished fifth while Andrew Schroeder, Ben Moudry, Kadden Kath, Jeremiah Christensen and Jim Chisholm rounded out the top 10. Sixty-eight drivers saw the green flag Friday night. Race fans will witness another complete program on Saturday with the winner of the USMTS/USRA Modified main event taking home $10,000. Out-Pace USRA B-Mods will battle for $1,200 to win and 30 drivers will start each main event three-wide. 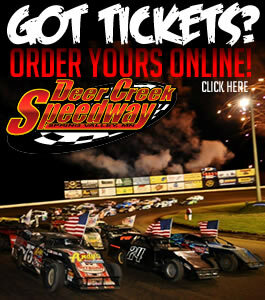 The pit gate opens at 2 p.m., driver sign-in begins at 3 p.m., grandstand gates open at 4 p.m., the drivers meeting will be held under the hospitality tent in the pit area at 5 p.m., opening ceremonies begin at 5:45 and racing gets underway at 6 p.m. Tickets are $30 or $10 for kids ages 12 and under. Showing finishing position, starting position in parentheses, car number, driver, hometown, chassis/engine builder, laps completed and money won. The top 15 in heat race passing points advance to the “A” Main with the top 8 redrawing for the first 8 starting spots. 1. (8) 10T Trevor Fecht, Allison, Iowa. 2. (3) 75 Cole Suckow, Cresco, Iowa. 3. (1) 41 Thor Anderson, Rock Valley, Iowa. 4. (6) C3 Chad Staus, Otterville, Mo. 5. (9) 81 Jared Boumeester, Waseca, Minn.
6. (4) 55H A.J. Hoff, Mantorville, Minn.
7. (5) 56H Brandon Hare, Elma, Iowa. 8. (7) 30 Josh Ruby, Lakota, Iowa. 9. (2) 88X Jimmy Broszeit, Postville, Iowa. 1. (1) 43 Zach Brom, Winona, Minn.
2. (2) 02 Cole Denner, New Hampton, Iowa. 3. (8) 4 Ryan Maitland, Waterloo, Iowa. 4. (6) 782 Jeremiah Christensen, Sioux Falls, S.D. 5. (4) 24 Tanner Johnston, Hayfield, Minn.
6. (3) 00 Devon Schlumbohm, Sioux Falls, S.D. 7. (9) 44 Aaron Wiersma, Sioux Falls, S.D. 8. (5) 53 Tianna Mithun, New Richland, Minn.
9. (7) 30V Dustin Von Hagen, Glenville, Minn.
1. (1) 30 Scott Demmer, Ellendale, Minn.
2. (5) 2 Brandon Maitland, Waterloo, Iowa. 3. (2) 3A Taylor Ausrud, Stewartville, Minn.
4. (4) 99 Noah Grinstead, Austin, Minn.
5. (6) 35X Parker Kessel, El Paso, Texas. 6. (7) 66 Darin Noyes, Sioux Falls, S.D. 7. (8) 17 Justin Murray, Owatonna, Minn.
8. (3) 49 Nate Whitehurst, Mason City, Iowa. DNS – 02K Hunter Kennedy, St. Ansgar, Iowa. 1. (1) 95X Shaun Walski, Winona, Minn.
2. (4) 18Y Jerry Young, Blooming Prairie, Minn.
3. (6) 83X Kadden Kath, Owatonna, Minn.
4. (2) 15W Alex Williamson, Rushford, Minn.
5. (3) 36K Jayden Larson, Mankato, Minn.
6. (9) 66L Levi Chipp, Latimer, Iowa. 7. (5) 17B Zach Benson, Princeton, Minn.
8. (7) 83 Billy Steinberg, Kasson, Minn.
9. (8) 28S Spencer Stock, Eyota, Minn.
1. (1) 26G Ryan Gierke, Villard, Minn.
2. (7) 7J Cory Jones, Zimmerman, Minn.
3. (4) 98 Kyle Anderson, Decorah, Iowa. 4. (8) 13X McKenzie Gerdes, Villard, Minn.
5. (5) 19 Ryan Siegle, Rochester, Minn.
6. (3) 15 Zach Elward, Hayfield, Minn.
7. (2) 23B Britt Olson Jr., Waseca, Minn.
8. (6) 55 Brody Shaw, Brownsdale, Minn.
1. (7) 476X Troy Hovey, Castalia, Iowa. 2. (3) 24C Jim Chisholm, Osage, Iowa. 3. (8) 02X Andrew Schroeder, Fremont, Iowa. 4. (1) 50 Robert Dose, Whitmore, Texas. 5. (4) 27 Channing Warner, Owatonna, Minn.
6. (5) 26 Abby Gierke, Villard, Minn.
7. (6) 27X Kevin Joachim, Larchwood, Iowa. 8. (2) 4W Tucker Williams, Rochester, Minn.
2. (6) 85 Ben Moudry, Hastings, Minn.
3. (1) 22P Steve Amundson, Owatonna, Minn.
4. (3) 11 Jake Masters, Graettinger, Iowa. 5. (4) 7+ Jared Timmerman, Norwalk, Iowa. 6. (2) 7C Cole Christensen, Sioux Falls, S.D. 7. (8) 7W Drew Williams, Rochester, Minn.
8. (7) 955 Lucas Grusinger, Chaska, Minn.
1. (4) 33S Dustin Steinbrink, Austin, Minn.
2. (3) 73 Kenny Boge Jr., Orchard, Iowa. 3. (7) 38 Michael Wytaske, Lansing, Minn.
4. (6) 6 Dustin Kruse, Brandon, S.D. 5. (5) 38S Cole Lonergan, Dexter, Minn.
6. (1) 83 Kylie Kath, Owatonna, Minn.
DQ – (2) 5 Dakota Foster, Gardner, Kan.
2. (6) 15W Alex Williamson, Rushford, Minn.
3. (5) 6 Dustin Kruse, Brandon, S.D. 4. (8) 36K Jayden Larson, Mankato, Minn.
5. (4) 22P Steve Amundson, Owatonna, Minn.
6. (9) 7+ Jared Timmerman, Norwalk, Iowa. 7. (14) 27X Kevin Joachim, Larchwood, Iowa, $30. 8. (1) 75 Cole Suckow, Cresco, Iowa. 9. (18) 28S Spencer Stock, Eyota, Minn., $30. 10. (15) 53 Tianna Mithun, New Richland, Minn., $30. 11. (11) 26 Abby Gierke, Villard, Minn., $30. 12. (7) 35X Parker Kessel, El Paso, Texas, $30. 13. (3) 98 Kyle Anderson, Decorah, Iowa, $30. 14. (16) 55 Brody Shaw, Brownsdale, Minn., $30. 15. (10) 55H A.J. Hoff, Mantorville, Minn., $30. 16. (12) 44 Aaron Wiersma, Sioux Falls, S.D., $30. DQ – (13) 56H Brandon Hare, Elma, Iowa, $30. DNS – 88X Jimmy Broszeit, Postville, Iowa, $30. 1. (1) 24C Jim Chisholm, Osage, Iowa. 2. (5) 81 Jared Boumeester, Waseca, Minn.
3. (14) 5 Dakota Foster, Gardner, Kan.
4. (7) 66L Levi Chipp, Latimer, Iowa. 5. (10) 00 Devon Schlumbohm, Sioux Falls, S.D. 6. (3) 41 Thor Anderson, Rock Valley, Iowa, $30. 7. (11) 7C Cole Christensen, Sioux Falls, S.D., $30. 8. (4) C3 Chad Staus, Otterville, Mo., $30. 9. (15) 49 Nate Whitehurst, Mason City, Iowa, $30. 10. (8) 19 Ryan Siegle, Rochester, Minn., $30. 11. (16) 4W Tucker Williams, Rochester, Minn., $30. 12. (13) 17B Zach Benson, Princeton, Minn., $30. 13. (9) 38S Cole Lonergan, Dexter, Minn., $30. 14. (17) 30V Dustin Von Hagen, Glenville, Minn., $30. 15. (12) 17 Justin Murray, Owatonna, Minn., $30. 16. (2) 02 Cole Denner, New Hampton, Iowa, $30. 17. (6) 50 Robert Dose, Whitmore, Texas, $30. 1. (13) 30 Josh Ruby, Lakota, Iowa. 2. (4) 782 Miah Christensen, Sioux Falls, S.D. 3. (6) 11 Jake Masters, Graettinger, Iowa. 4. (2) 13X McKenzie Gerdes, Villard, Minn.
5. (5) 99 Noah Grinstead, Austin, Minn.
6. (15) 955 Lucas Grusinger, Chaska, Minn., $30. 7. (10) 15 Zach Elward, Hayfield, Minn., $30. 8. (1) 73 Kenny Boge Jr., Orchard, Iowa, $30. 9. (12) 23B Britt Olson Jr., Waseca, Minn., $30. 10. (11) 7W Drew Williams, Rochester, Minn., $30. 11. (3) 3A Taylor Ausrud, Stewartville, Minn., $30. 12. (14) 83 Billy Steinberg, Kasson, Minn., $30. 13. (7) 24 Tanner Johnston, Hayfield, Minn., $30. 14. (16) 02K Hunter Kennedy, St. Ansgar, Iowa, $30. 15. (9) 66 Darin Noyes, Sioux Falls, S.D., $30. 16. (8) 27 Channing Warner, Owatonna, Minn., $30. DNS – 83 Kylie Kath, Owatonna, Minn., $30. 1. (3) 476X Troy Hovey, Castalia, Iowa, 20, $1000. 2. (4) 10T Trevor Fecht, Allison, Iowa, 20, $700. 3. (1) 33S Dustin Steinbrink, Austin, Minn., 20, $500. 4. (2) 7J Cory Jones, Zimmerman, Minn., 20, $400. 5. (8) 16 Dan Hovden, Decorah, Iowa, 20, $350. 6. (13) 02X Andrew Schroeder, Fremont, Iowa, 20, $300. 7. (7) 85 Ben Moudry, Hastings, Minn., 20, $275. 8. (16) 83X Kadden Kath, Owatonna, Minn., 20, $250. 9. (21) 782 Jeremiah Christensen, Sioux Falls, S.D., 20, $225. 10. (17) 24C Jim Chisholm, Osage, Iowa, 20, $200. 11. (6) 30 Scott Demmer, Ellendale, Minn., 20, $175. 12. (15) 38 Michael Wytaske, Lansing, Minn., 20, $160. 13. (19) 15W Alex Williamson, Rushford, Minn., 20, $150. 14. (22) 6 Dustin Kruse, Brandon, S.D., 20, $145. 15. (26) 66L Levi Chipp, Latimer, Iowa, 20, $140. 16. (25) 36K Jayden Larson, Mankato, Minn., 20, $130. 17. (32) 75 Cole Suckow, Cresco, Iowa, 20, $120. 18. (29) 00 Devon Schlumbohm, Sioux Falls, S.D., 20, $115. 19. (14) 18Y Jerry Young, Blooming Prairie, Minn., 20, $110. 20. (5) 2 Brandon Maitland, Waterloo, Iowa, 20, $105. 21. (27) 13X McKenzie Gerdes, Villard, Minn., 20, $100. 22. (30) 99 Noah Grinstead, Austin, Minn., 20, $100. 23. (28) 22P Steve Amundson, Owatonna, Minn., 13, $100. 24. (9) 43 Zach Brom, Winona, Minn., 12, $100. 25. (12) 4 Ryan Maitland, Waterloo, Iowa, 12, $100. 26. (18) 30 Josh Ruby, Lakota, Iowa, 9, $100. 27. (24) 11 Jake Masters, Graettinger, Iowa, 8, $100. 28. (10) 95X Shaun Walski, Winona, Minn., 7, $100. 29. (20) 81 Jared Boumeester, Waseca, Minn., 7, $100. 30. (11) 26G Ryan Gierke, Villard, Minn., 6, $100. 31. (23) 5 Dakota Foster, Gardner, Kan., 4, $100. 32. (31) 7+ Jared Timmerman, Norwalk, Iowa, 1, $100. Total Laps Led: Hovey 20. Margin of Victory: 1.304 seconds. Time of Race: 15 minutes, 49.320 seconds (3 cautions). Points Standings: Hovden 1322, Moudry 1170, Suckow 941, J. Christensen 765, Timmerman 721, C. Christensen 701, Chisholm 598, Kruse 504, Denner 493, Williamson 483.